France was on edge over terrorism even before the Charlie Hebdo attack. 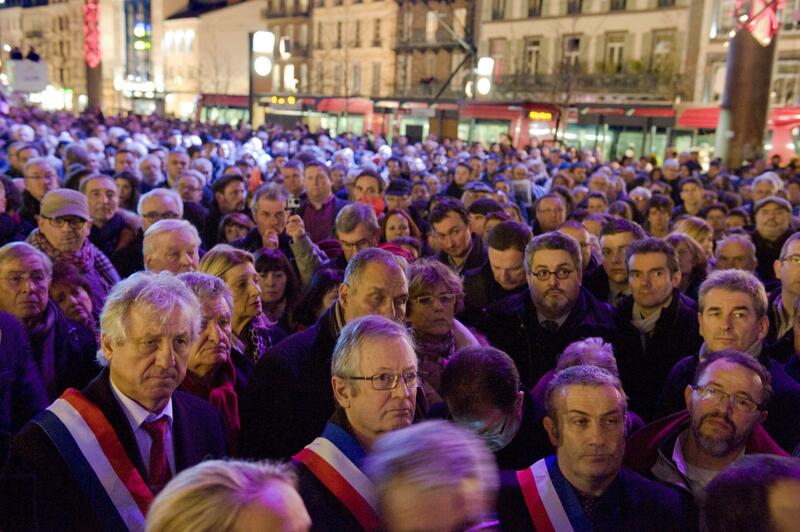 People rally in support of the victims of the attack on the offices of the satirical weekly Charlie Hebdo, in Clermont-Ferrand, on Jan. 7, 2015. We still don’t know much about the attackers who killed 12 people at the offices of the satirical newspaper Charlie Hebdo in Paris on Wednesday, though the paper’s track record on poking at Islamic extremists and the video of the black-clad gunmen chanting “Allahu Akbar” as they made their escape makes their motivation pretty apparent. France, a member of the international coalition fighting ISIS, is also one of the leading suppliers of foreign fighters to ISIS and other Islamic extremist groups. The French interior ministry stated in September that about 930 of its citizens are fighting with jihadist groups, including ISIS and the al-Qaida-affiliated Jabhat al-Nusra, in Iraq and Syria. France is one of a number of European nations that instituted policies last year aimed at preventing young people from traveling to the Middle East to take up arms, motivated in part by fears that these fighters could return to France to carry out attacks at home. The concern is legitimate. Senior ISIS leaders have specifically called for attacks against citizens of France, as well as other countries involved in the coalition. Last May, Mehdi Nemmouche, a French jihadist of Algerian origin who had spent time fighting with ISIS in Syria, shot and killed four people in an attack on the Jewish Museum of Belgium in Brussels. A French journalist who was held captive by ISIS later recalled being beaten by Nemmouche. And in November the French government confirmed that two Frenchmen had appeared in the video depicting the beheading of American aid worker Peter Kassig as well as 18 Syrian prisoners. Recent days have also seen a series of smaller attacks in France. On Dec. 20, French police shot dead a man who had shouted “Allahu Akbar” while stabbing three officers in a police station near the city of Tours. Just before Christmas, the country saw two attacks, one in Nantes and another in Dijon, involving cars hitting pedestrians, which fit a pattern of similar recent attacks around the world. In the car attacks, prosecutors specifically said the men were mentally unbalanced and that these were not instances of political or religious terrorism, though that definition seems a little hard to parse given that the Dijon driver was a recent convert to Islam who was reportedly upset over the treatment of Chechen children. It is fair to say that these earlier attacks were almost certainly the work of self-motivated lone actors who may have been inspired by jihadist propaganda but weren’t acting under direct orders from anyone. These kinds of attacks are extremely hard to prevent—lone wolves leave less of a paper trail than organized terror cells—but tend not to be all that effective. Wednesday’s attack was several orders of magnitude more sophisticated and deadly than these earlier efforts. One early eyewitness account suggests that Wednesday’s gunmen identified themselves as members of “al-Qaida in Yemen,” which is likely a reference to the Yemen-based chapter more commonly known as al-Qaida in the Arabian Peninsula. AQAP isn’t linked to ISIS, though its compatriots in Jabhat al-Nusra have also been targeted by Western airstrikes in recent months. Whether or not it turns out that the gunmen were under orders from AQAP or another group, this was an attack that likely took extensive planning and coordination. Last month Prime Minister Manuel Valls warned that France was facing an “unprecedented” threat from terrorism. At the time it seemed a bit of an overstatement in a country that has sadly known its share of terror over the years. Judging by the fact that the perpetrators were able to carry out such a well-executed attack in a major European city, escape the scene, and reportedly did it speaking perfect French, he may have been right. Read more of Slate’s coverage of the Charlie Hebdo attack.